The Connecticut Air National Guard began with the activation W.W.I. Later, the National Defense Act of 1921 provided for a number of National Guard Aviation Squadrons and the 43rd Aero Squadron was redesignated as the 43rd Division Air Service Squadron. Before Brainerd Field in Hartford was completed in 1923, the squadron was based in Rhode Island. When construction was complete, the unit was reorganized as the 118th Observation Squadron and its first aircraft was the Curtis JN-4 “Jenny”. During WW II, the 118th was activated and flew anti-submarine missions along the east coast. Later, in 1943, the unit transitioned to combat aircraft (P-49, P-39, A-20, B-25, and finally, the P-51) and was redesignated as the 118th Tactical Reconnaissance Squadron. In 1944, the 118th was reassigned to the China-Burma-India theater of operations as part of the 23rd Fighter Group, the “Flying Tigers.” The unit participated in security patrol, close air support, and ground attack missions as part of the 23rd Fighter Group. Following the conclusion of the war, the 118th was officially disbanded. After the war, the Air National Guard was created and air units were allocated to states as determined by local defense requirements. Connecticut was allocated a fighter group, which consisted of one tactical unit and three supporting units. During the Korean War, almost all of the state’s aircrews were assigned to combat duties overseas while the wing was redesignated as the 103rd Fighter Interception Wing and assigned to the Air Defense Command. From 1956 to 1971, members of the Connecticut Air Guard stood 24-hour alert in the F-102 Delta Daggers. In 1971, the 103rd was assigned to the newly redesignated Tactical Air Command. From 1971 – 1979, the 103rd flew the F-100 Super Sabres and its mission was close air support. In 1979, the unit was assigned the new A-10 Thunderbolt IIs, designed specifically for close air support and ground attack missions. In 1991 the wing began an aggressive conversion to the F-16C, however in 1993 that conversion was cancelled. As a result, the wing remained in the A-10 until December 2007. Elements of the 103rd Fighter Wing have deployed to augment combat operations during Deny Flight and Precise Endeavor. In August 1996, the 103rd FW deployed to Aviano AFB, Italy to assume the primary close air support mission of international forces in Bosnia. The unit is also tasked to provide assistance during statewide emergencies and disasters when called upon by the Governor’s office. 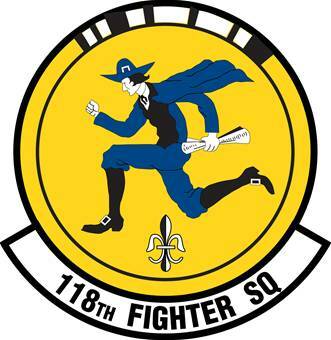 The 118th Fighter Squadron was is located at the Bradley Air National Guard Base, located approximately 20 miles north of Hartford in northern Connecticut. The base is home to the 1000 personnel and equipment that make up the 103rd Fighter Wing, which was recently awarded the Air Force Outstanding Unit Award following a highly successful Operational Readiness Inspection in the fall of 1999. After BRAC 2005, the 118th lost its A-10 and began transition to the C-21. The last operational A-10 sortie took place December 28, 2007. No longer a fighter squadron, the Flying Yankees have been redesignated the 118th Airlift Squadron on April 1, 2010.